Amidst predictably fawning media coverage, California Governor Jerry Brown delivered his sixteenth and final State of the State address at the State Capitol in Sacramento on January 25. Brown proclaimed that the “bolder path is still our way forward” on climate change, cap-and-trade and infrastructure investment, including the implementation of the water bond of 2014 and the construction of his Delta Tunnels, and an array of other issues. “The goal is to make our neighborhoods and farms healthier, our vehicles cleaner — zero emission the sooner the better — and all our technologies increasingly lowering their carbon output. To meet our ambitious goals, we will need five million zero-emission vehicles on the road by 2030. 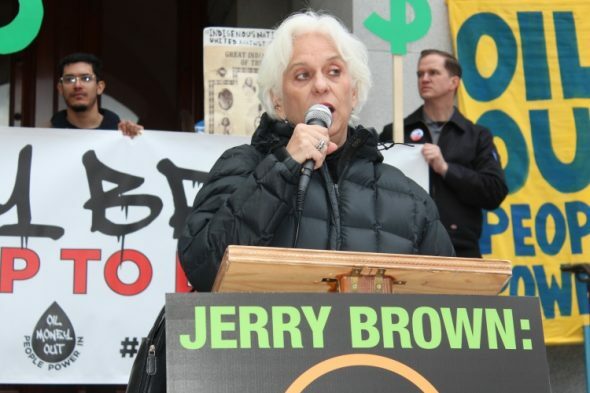 Think of all the jobs that will create and how much cleaner our air will be,” said Brown. A statement from Western States Petroleum Association (WSPA) President Catherine Reheis-Boyd praising the Governor’s State of the State address pretty much summarizes the oil industry’s deep partnership with Jerry Brown since he began his fourth term as Governor In January 2011 and their strong support of his controversial carbon trading program. 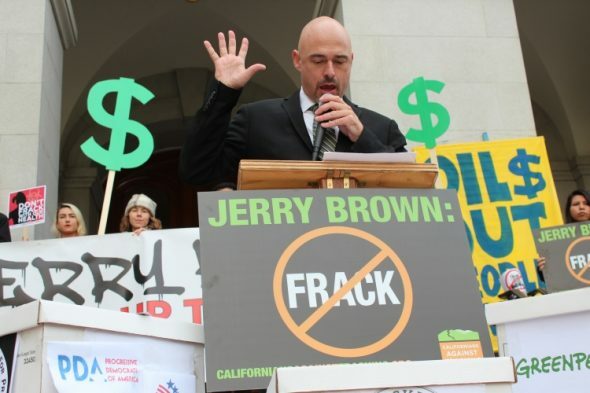 In fact, documents leaked to the media in 2017 revealed that Brown’s highly touted cap-and-trade bill, AB 398, was based on a WSPA and Chevron wish list. “Throughout Governor Brown’s historic years leading our state, he has worked to ensure California sets ambitious standards in climate change policy. As our state’s leading energy producers, we we continue to work with him, future Governors and our state’s leaders to me California’s climate change goals. Despite hundreds of millions in state rebates and investments, even the Governor noted today that zero emission vehicles, like electric cars, represent a very small percentage of the vehicles on the road today. Of the nearly 26 million passenger cars in California, only 300,000 are zero emission vehicles. While Brown has continually portrayed himself as a world “climate leader” fighting Trump’s anti-environmental policies, he has actually gone out of his way to please the oil and gas industries. He and his causes received over $9.8 million from oil companies, gas companies and utilities since he began running for his third term as Governor in 2009. Jerry Brown has already done what Trump would like to do; expand offshore oil drilling. Brown’s regulators have expanded offshore drilling by 17 percent in state waters under existing leases, approving 238 new wells between 2012 and 2016, according to Department of Conservation data. Onshore, the number of active oil and gas wells has jumped 23 percent from 53,825 in 2009, the year before Brown was elected Governor, to 66,516 onshore wells at the end of 2016. – He has expanded fracking and other oil extraction techniques onshore. – He pressured the Trump adminIstration to grant three major oil fields in Kern County exemptions from the Safe Drinking Water Act. – His regulators have overseen the irrigation of crops with oil waste water. – He signed the green light for fracking bill, an already bad bill that was made even worse when it was gutted by the oil industry, in September 2013. – He has overseen water export policies that have led winter-run and spring-run Chinook salmon, Delta and long fin smelt, green sturgeon and other fish species to the edge of extinction. After Brown delivered his State of the State address, a victim of urban oil drilling in Los Angeles joined health professionals and members from the Oil Money Out Campaign, a coalition of environmental, advocacy and political groups, at a press conference on the north steps of the state capitol delivering 80,000 petitions to Governor Brown calling for oil money out of California politics. 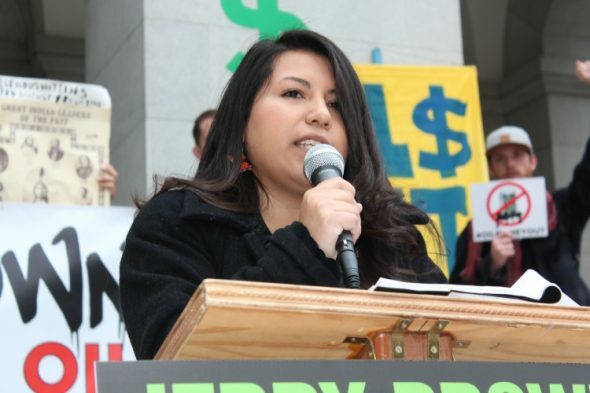 Gabriela Garcia, whose family lives near LA’s oil wells, doesn’t share Reheis-Boyd’s rosy assessment of Jerry Brown’s “leadership” on climate. She shared her personal experience and health problems that resulted within her family and community, due to living in close proximity of urban oil drilling. “I’ve watched my community suffer enough. It is a human right to breathe clean air, no matter where you live, and I shouldn’t have to tell my children, we can’t walk to the park today because the air in our neighborhood will make us sick,” said Garcia, a long time Los Angeles resident and member of People Not Pozos(People not Wells). In 2015, the California Council on Science and Technology (CCST) report, mandated by SB 4, the state’s fracking law, determined that fracking and urban drilling are dangerous for California, according to David Braun, director of Rootskeeper and Oil Money Out. The report urged mandatory human health buffer zones around all oil operations to protect public health; currently there are none in California like there are in Colorado, Texas and other states. “To date, none of the scientific recommendations have been implemented, leaving communities and individuals vulnerable to impacts,” said Braun. The 80,000 petitions calling for California politicians to stop taking oil money were collected by CREDO, Rootskeeper, Other 98, Friends of the Earth, Daily Kos, People Demanding Action, Progressive Democrats of America, Amazon Watch, Breast Cancer Action, Center for Biological Diversity, Stand.Earth, Climate Hawks Vote, Courage Campaign, Earthjustice, Food and Water Watch, Greenpeace, Root Strikers, California for Progress, Earthworks, 350 Silicon Valley, Sunflower Alliance, and others. 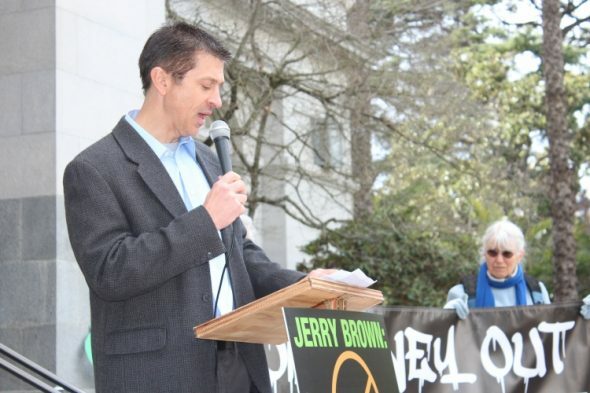 Brown also used his speech to promote his Delta Tunnels, also known as the California WaterFix, considered by opponents to be the most environmentally destructive and unjust public works project in recent California history. “Tunnels opponents are convinced that neither solution will save CA WaterFix from failure, and will deal a devastating blow to the health of the ailing San Francisco Bay-Delta estuary,” said Barbara Barrigan-Parrilla, Executive Director of Restore the Delta (RTD). “That is why the Delta tunnels are such a bad idea,” she said. “One or two 35-mile pipes to divert the Sacramento River from the San Francisco Bay-Delta estuary is not a plan to get along with nature,” she stated. “We agree with Governor Brown’s comments about climate change science, planning, and response. This is the most important government work that should be done. However, Delta tunnels that will have less and less water in them with declining watersheds are not a sustainable water management solution to meet our climate change challenges,” she explained. 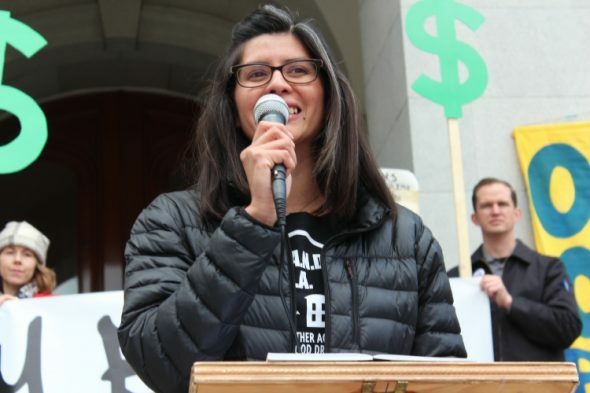 Barrigan-Parrilla said she disagrees with the Governor’s beliefs that the CA WaterFix will “conserve water and protect fish,” pointing out that the EIR for WaterFix demonstrates that imperiled fish like Delta smelt and salmon do worse with the tunnels. “Moreover, how are the tunnels going to be used to conserve water when water will have to be continuously delivered to repay $17 billion worth of bonds, plus interest, and operations?” she asked. 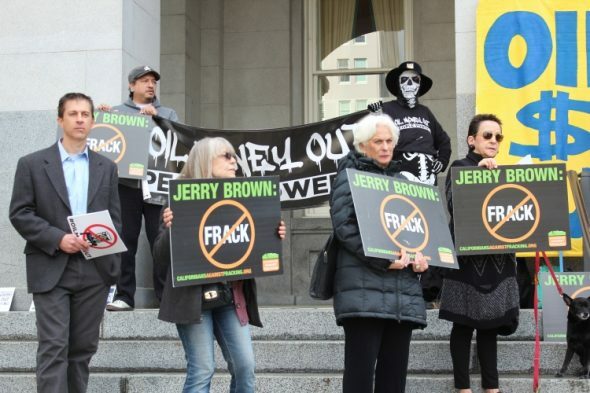 Since it’s Brown’s final year in office, he still has the chance to do the right thing on a number of environmental issues, including stopping the expansion of fracking and offshore oil drilling that appears to be so dear to his “green” heart. Noemi Tungui of Food and Water Watch speaks on the impacts of oil drilling on farmworker communities in the Oxnard area. Photo by Dan Bacher. Gabriela Garcia from People Not Pozos,whose family lives near a few of LA’s oil wells, shared her personal experience and health problems that resulted with her family and community because of living close to urban oil drilling. Photo by Dan Bacher. Melissa Johnson-Camancho, an RN who is also with California Nurses Association, talks about the health impacts of oil drilling. Photo by Dan Bacher. RL Miller of Climate Hawks vote discusses the work she has been doing to make sure that protections for our communities and the climate really get enacted. Photo by Dan Bacher. 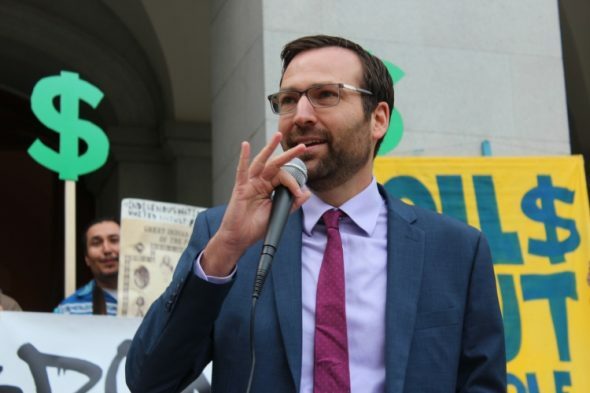 Senate Ben Allen pledged to take no donations from Big Oil before his speech at the Capitol rally. Photo by Dan Bacher. 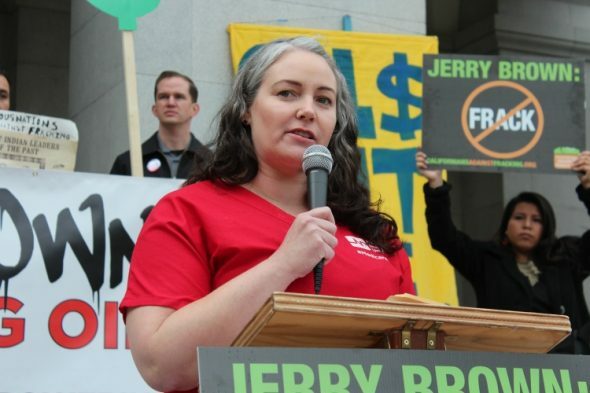 Liza Tucker, Consumer Advocate for Consumer Watchdog, speaks about how Jerry Brown has expanded offshore oil drilling in California by 17 percent. Photo by Dan Bacher. David Braun, director of Rootskeeper and Oil Money Out, MCs the rally. Photo by Dan Bacher. Brian Nowicki, the Center for Biological Diversity’s California climate policy director: “We can’t afford to let dirty oil money hold us back from a clean energy future.” Photo by Dan Bacher. 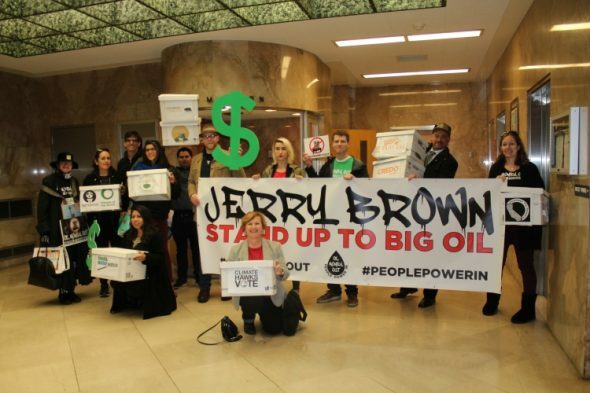 The group with their petitions before delivering them to Governor Jerry Brown’s Office. Photo by Dan Bacher. 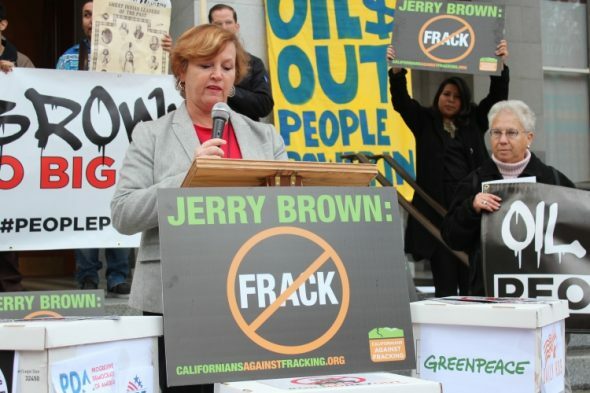 Rallying to get oil money out of California politics on January 25. Photo by Dan Bacher.